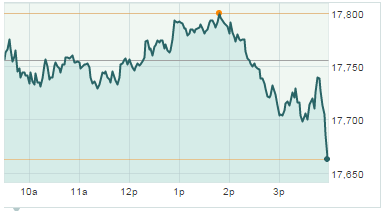 The Dow Jones Industrial Average today (Friday) dipped 92 points as traders reacted to mixed earnings reports. The S&P 500 was on track for the best month in four years, as markets largely pushed aside concerns about the global economy, remained optimistic the Fed won't hike rates in 2015, and reacted favorably to loose monetary policy from central banks around the globe. Today's top performing sector was energy, as shares of Chevron Corp. (NYSE: CVX) and Exxon Mobil Corp. (NYSE: XOM) were both up 2% at one point during the trading session before paring gains. Oil prices gained during Friday's trading session. December WTI oil prices jumped 0.7% to hit $46.39 per barrel, while Brent crude prices added 1.2% to hit $49.39. Stock Market News: Five of 10 S&P sectors were in the red this afternoon, with energy stocks adding the biggest boost, and financial stocks and non-cyclical goods stocks the largest decliners. The non-cyclical goods sector was down after CVS Health Corp. (NYSE: CVS) fell nearly 5% after offering a disappointing outlook for 2016. Financial stocks slumped late in the session on news U.S. banks are facing a $120 billion short fall in the Fed's crisis plan. Inversion Backlash: Merger and acquisition activity was back in focus today on news Botox-maker Allergan Plc. (NYSE: AGN) could be purchased by Pfizer Inc. (NYSE: PFE), the largest U.S. drug maker. The news set off a firestorm of criticism in Washington as politicians raised concerns about companies relocating abroad in order to avoid the highest corporate tax code in the OECD. Despite harsh rhetoric, Congress is unlikely to reform the tax code before the 2016 election. On Tap Next Week: On Monday, the PMI Manufacturing Index Flash will provide some insight into the strength of the economy in the fourth quarter. Meanwhile, keep an eye on the ISM manufacturing index and monthly construction spending. Companies reporting earnings on Monday include Visa Inc. (NYSE: V), SYSCO Corp. (NYSE: SYY), Fitbit Inc. (NYSE: FIT), Diamond Offshore Drilling Inc. (NYSE: DO), and Fabrinet (NYSE: FN). Stocks to Watch No. 1, XOM: Shares of Exxon Mobil Corp. (NYSE: XOM) were up nearly 1% after the company beat quarterly earnings estimates. The firm reported earnings of $1.01 per share and revenue of $67.34 billion. Both figures topped expectations of $0.89 on top of $61.7 billion. Stocks to Watch: No. 2, CVX: Shares of Chevron Corp. (NYSE: CVX) were up more than 1% after the company blew away muted quarterly earnings estimates. The global oil giant announced plans to cut 10% of its workforce and cut its annual Capex budget. The company reported an EPS of $1.09 per share and $33 billion in revenue. Both figures topped expectations of $0.83 on $31.1 billion in revenue. Stocks to Watch No. 3, VRX: Shares of Valeant Pharmaceuticals Intl. Inc. (NYSE: VRX) stock slumped another 16% after the company announced plans to finish its relationship with Philidor RX, a pharmacy used to boost sales of some of Valeant's pricey drugs. The announcement comes after CVS Health Corp. (NYSE: CVS) and Express Scripts Holding Co. (Nasdaq: ESRX) said they would also cut the specialty pharmacy from their networks. Stocks to Watch No. 4, KEY: Shares of KeyCorp (NYSE: KEY) slumped more than 7% after the company announced plans to purchase First Niagara Financial Group Inc. (Nasdaq: FNFG) for up to $4.1 billion. Share of First Niagara fell roughly 0.3%. Stocks to Watch No. 5, GPRO: Shares of GoPro Inc. (Nasdaq: GPRO) have declined more than 16% from Wednesday's closing price after the company badly missed on top and bottom line estimates for Q3 earnings. After the bell on Wednesday, the company reported earnings per share (EPS) of $0.13 on revenue of $400.3 million. Those fell short of estimates of $0.29 per share on revenue of $433.6 million. who is in back of this newsletter? Get to know about US market.